Indulgent flavors, without the guilt. Place diced apple on a baking sheet and bake for 30 minutes, or until dry but chewy. In a large sauté pan, heat oil over medium-high heat. Add almonds, brown sugar and spices. Toast until warm and fragrant, about 8 minutes. Melt chocolate bar in microwave, on high, stirring every 30 seconds for 1-2 minutes. Place popped popcorn on a baking sheet and drizzle with melted chocolate, let cool. 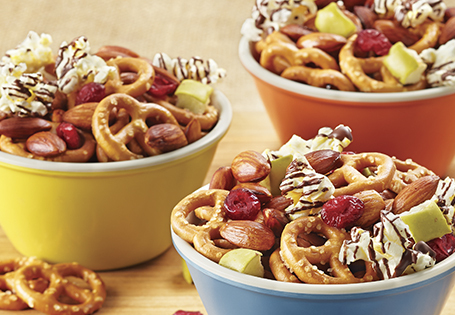 In a serving bowl, combine apples, almonds, popcorn, cranberries and pretzels. TIP: For a whimsical touch, serve in champagne flutes!